German migrants first shifted into the Brisbane River district in the late 1860s and erected a church for their needs. They were a part of a general movement of German people who had first settled closer to Brisbane at Nundah (previously known as German Station), Zillmere (Zillman’s Waterholes) and the Logan area. When land became available further inland, they moved to the Vernor area and also to Harrisville (Normanby Reserve). Further settlement took place at Mt. Walker and then at other areas including Kalbar (Engelsburg), Boonah, Blenheim, Laidley and Tent Hill. Churches were successively erected in these areas. They were linked together in various combinations, especially under the name of the German Baptist Conference, a body which existed until after World War I. After this, these German churches began to affiliate with the Baptist Union of Queensland of which they became valued members. Minden Baptist Church was established by German settlers in 1884 (or perhaps earlier in 1879) prior to which people in the area journeyed to Marburg (then known as Rosewood Scrub) to worship at the Baptist Church which was established there in 1871, and served the area until its closure in 1988. A church was erected at Minden in 1885; a portion of the property close to the church was set aside as a cemetery under the administration of the church. The cemetery is still in use under the control of the church, but no register or plan is available. The Baptist Cemetery, at Old Fernvale Road, Vernor, was established in 1876 to serve the needs of the church community in the area. The original site of the church at Vernor is not known, but was not at the cemetery site. It may have been at the corner of Fernvale-Lowood Road and Fielding Street. 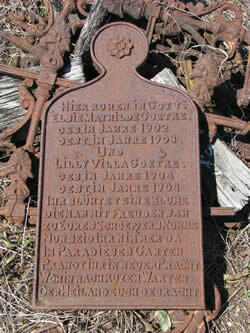 During the flood of 1893 the church was, however, washed away which resulted in the loss of the deeds for the cemetery. It was then re-located south of Lowood on Lowood Hills Road, and then in 1926, re-located again to Tarampa on Minden Road to be closer to its congregation. Due to declining numbers, it was closed early in 1995. In 1933, a new cemetery — Tarampa Baptist — was established west of Lowood on the Forestvale Road. This cemetery is currently in use and is under the care of local trustees. The last burial in the Vernor cemetery took place in the 1950s. No register or plan for the Vernor Cemetery has been found, but the cemetery papers and other records for the Tarampa Church are in the care of the Baptist Archives. At various times, the churches of Marburg, Minden and Vernor/Tarampa shared ministers, services, facilities and administration. Today the whole area is served by the Minden church alone with other churches being located at Rosewood, Laidley (previously at Blenheim), Boonah, Kalbar (Engelsburg), Tent Hill, Gatton and several in the Ipswich area.